On Friday 29 March 2019, the East London Mosque & London Muslim Centre was privileged to host His Excellency Ümit Yalçın, the Turkish Ambassador to the UK. His visit to the Mosque was part of his mission to engage the Muslim community in Britain. 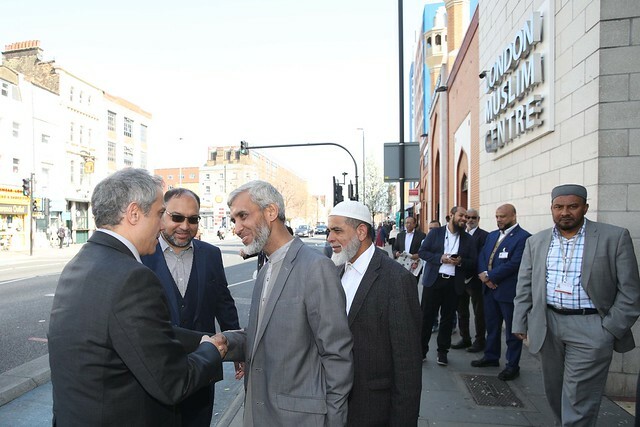 Serving the largest Muslim communities in the UK, and with up to 7,000 attending the Jumu’ah (Friday) prayers, the Ambassador was able to glimpse the vibrancy of the East London Mosque. He visited the Mosque’s recently opened Archives and Strongroom. Dr Jamil Sherif, Chair of the ELM Archives Committee, talked about manuscripts stored in the archives from the Ottoman era. The Ambassador then joined the Jumu’ah prayers, listening to a khutbah (sermon) on the topic of justice, delivered by Imam Mohammed Mahmoud who this week returned from a visit to New Zealand. “Turks are the part of the strong Muslim community in London, and I am proud of the cultural contribution by the Muslim community to this city,” he added. Hakan Camuz from StokeWhite, former director of the Turken Foundation UK, joined Dr Abdullah Faliq, host and Member of the East London Mosque Trust, in thanking the Ambassador for taking the time to visit the Mosque within six months of his appointment as Ambassador to the UK. They encouraged the building of stronger ties, and to be part of making great changes for the betterment and advancement of Muslim communities.